Apologies for the lack of posting recently, but its not going to get any better for a while. Having the two kids now definitely eats into my crafting time and some days I'm not even getting to pick the needles. The last two evenings though I've managed to get both of them to sleep at the same time for a few hours so hopefully in a month or two I'll get back to writing patterns, etc. For now, here is my second crochet project. I saw this on Ravelry and immediately thought of my sister. Its just so her! I love this little guy, and at only 2.5 inches long he doesn't take long to knit up. 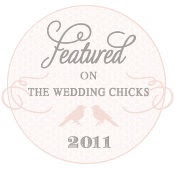 And my little cake toppers made it into the article. Woo hoo! Looks like the kind of wedding I wished I could have created for my own wedding. It's a completely toy issue so check it out if you any little kiddies to knit for! A beginner pattern from 'The Needlecraft Book' which I made even simpler by omitting the stripey body and just doing it one colour. I don't think he turned out too bad. Turns out I can crochet a bit, as long as I take my time. Oh my gosh, life is tougher with two kids! Not sure how I'm going to get much knitting in anymore. But I suppose it'll all work itself out when Oliver gets a routine and we all get settled. The last two days were particularly busy as DH was very busy during the days and was out both evenings so it was pretty much just me and the kids the two days. So today he has taken Emily(Smem) out for a few hours to the park and McDonalds so I've had a bit of time at home just with Oliver. And he's slept since they went so I got some sewing done. Viola, a nursing dress. Its loosely based on this pattern. I took apart an old maternity dress that I made while pregnant with Emily. I didn't have quite the right amount of fabric to make the top into a dress as per the pattern but I just fudged the top and skirt to make it into a dress. Another quick knit for Oliver - The Pebble Vest. Another easy to follow pattern, that uses very little yarn. It only just fits him though, so if I make more I'll have to go up a needle size or two, or cast on some more stitches. Alain - What a Pretty Vest! A little bit of knitting for myself. My mother had bought me some wool for my birthday back in February and when I saw this pattern I thought it would suit it perfectly. I messed up by knitting one of the fronts too long, even though I was measuring the whole time that I was knitting it. So that involved a bit of cutting and additional sewing, which I'm hoping will stay in place! It was a quick and easy pattern to knit and the little crochet edging really finishes it off well. The Cabled Flying Helmet by Sublime, was a quick knit to get his head covered for outdoor excursions.